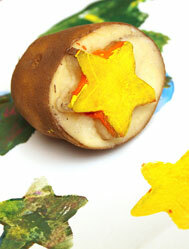 This arts & crafts lesson plan outlines how to make potato stamps for decorating gift wrap. This is a fun and creative activity to enjoy around any gift-giving season, like Christmas, Kwanzaa, and Hanukkah. Students use stamps to decorate paper. Cut a potato in half, then have students carve out the design they want (a dreidel, stars, a Christmas tree). An easy way to do this is to push a cookie cutter all the way in to the potato and cut off the excess with a butter knife. Remember the design will be the raised portion of the cutout. Stamp potato on ink pad then paper. Or put different color tempura paints onto individual paper-plates. Kids can either press potato into paint or use a brush to paint the bottoms.